The interface between technology, society and politics is exciting, but challenging. It requires collaboration across boundaries and between people working in very different disciplines. It is intellectually hugely rewarding, but places considerable demands on those involved. It necessitates working closely with people beyond the perimeters of traditionally defined academia. This new series of “conversations” being convened by Profs. Lizzie Coles-Kemp (Information Security) and Tim Unwin (Geography) under the auspices of the UNESCO Chair in ICT4D is intended to provide an opportunity for postgraduates across Royal Holloway, University of London, to come together to discuss these issues in both practical and conceptual ways. The informal conversations will take place approximately monthly and will usually be between 1 and 2 pm. This is a lunch time event and bring and share lunches are encouraged. There will also be opportunities for more informal discussions afterwards for those able to stay on. The first conversations will take place as follows, with topics and timings of future conversations being determined very much by the wishes of participants. 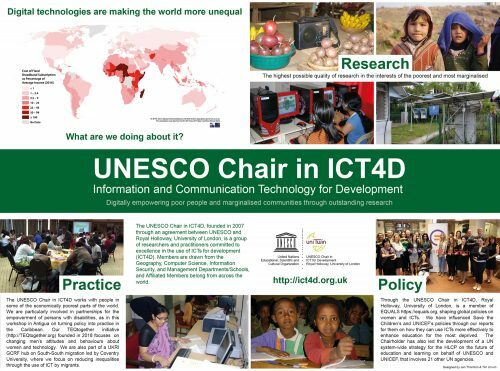 The UNESCO Chair in ICT4D also convenes a seminar series at which visiting speakers and members of the Chair present the findings of their research, as well as sharing ideas on particular issues. Many of these more formal seminars will also be of interest to those participating in the Technology and Empowerment conversations.